Master of law, Master of veterinary medcine, Her Highness Doctor Princess Gertraud-Antonia zu Schaumburg-Lippe, former member of the legislative assembly of Salzburg was born in the city of Salzburg: Princess Antonia is an award-winning author and journalist specializing in thoroughly-researched features and profiles. She writes for German, Austrian and international magazines, newspapers and is a celebrity TV-host and TV-expert. She has interviewed and worked with the biggest publications and has been featured in hit-formats like Spiegel TV, RTL, Sat1, Pro7, Puls 4, Sixx, ORF, Servus TV and also presented news in her sons Hit-TV-Show Astro Royal on Astro TV Networks. Her parents were the daughter of a metal-industrial and businesswoman Mag.iur. Dr.iur. Edith Schöppl, of viennese jewish heritage, and the businessman Adolf Schöppl. She opened her private veterinary clinic and served as head of the district veterinary department and government veterinary doctor. The residents of the federal district of Salzburg in Austria elected her as a politician to the legislative counsel and she served in legislation and changed law to the benefit of people and animals. For her work and duty she received several badges of honors and decorations, like the golden order of Salzburg, or the angel from the city of Salzburgs Major. In Brussels, she served as a member of the board of an NGO. Also Diplomas in the scientific animal protection have been awarded. Several years ago, she also finished her studies of law and graduated with a Master of law degree. With her former husband, she gave birth to her son Mag.Dr.iur. Mario-Max Schaumburg-Lippe, MAS, LL.M, who was adopted by the beloved HSH. Helga Claire Lee Princess of Schaumburg-Lippe, Sekundogenitur Nachod (aunt of his father H.H. Prince Waldemar), because she could not give birth to a heir and she wished her endavours to be continued. By court ruling HH. Prince Waldemar and his birth mother H.H. 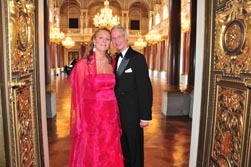 Princess Antonia are declared his legal and official parents. H.H. Dr. Princess Gertraud-Antonia is married to her beloved husband, H.H. Prince Waldemar zu Schaumburg-Lippe, Sekundogenitur Nachod, the son of H.R.H. Princess Feodora of Denmark and cousin of Her Majesty Queen Margarethe II. of Denmark. Her husband is part of the line of succession to the British Throne.